After six years in Kansas City's farm system, Tim Melville and the Royals parted ways at the end of 2014. A highly touted high schooler who fell to the fourth round of the 2008 Draft only because of perceived signability issues, the right-hander made it to Double-A Northwest Arkansas in his fourth year with the organization but never took that next step after injuries and command issues sidelined him in 2012 and 2013 and hampered his development last year. Now with a fresh start with a new team, Melville is starting to make progress in hopes of keeping his Major League dream alive. 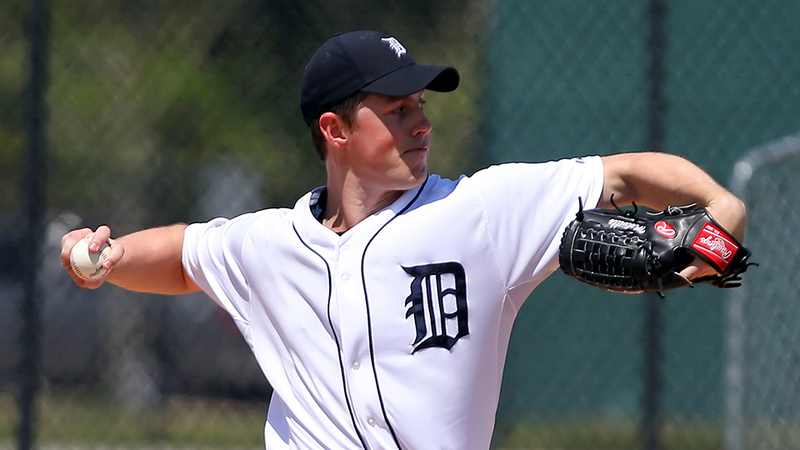 Signed by the Tigers as a Minor League free agent over the winter, Melville allowed one hit over six scoreless innings on Tuesday night to pitch Triple-A Toledo to a 6-2 win at Charlotte. The 25-year-old struck out five, issued four walks, hit a batter and threw 44 of 88 pitches for strikes in earning his first win of the season and first at the Triple-A level. The lone hit against Melville (1-2) was Jason Coats' two-out single in the second inning, but the Missouri native retired the next nine batters to keep the Knights off the board and out of the hit column. "[Melville] was just mixing his pitches well and he had us off-balance and found a way to get the ball passed us at the plate," Knights first baseman Dan Black told the Charlotte Observer. "We'll come back out here tomorrow and get some hits." After he was drafted by the Royals, Melville started his career with Class A Burlington in the Midwest League before advancing to Wilmington, where he spent most of 2010 and the entire 2011 season. Melville made only 10 appearances across three levels in 2012 before undergoing Tommy John surgery, then logged 3 2/3 innings in a pair of Rookie-level leagues the following year. He pitched in the Texas League again with the Naturals last season but issued 68 walks in 129 1/3 innings while going 2-11 with a 5.50 ERA. Against the Knights, Melville got plenty of offensive help in his fourth International League outing, primarily from leadoff hitter Daniel Fields, who was 4-for-5, and right fielder Steven Moya, who recorded his first Triple-A three-hit game. Fields, Detroit's No. 25 prospect, tripled, singled three times, stole two bases and scored twice to lift his average to .356. The 24-year-old is 16-for-34 with five triples in his last eight games, during which he's been on base 23 times. Charlotte starter Brad Penny (1-2) yielded an unearned run on four hits and a walk while striking out one over four innings in a losing effort.